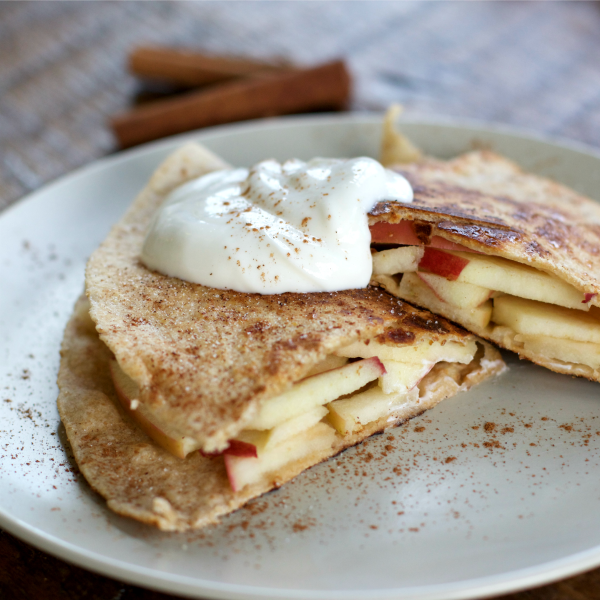 These Apple Cinnamon pockets are a great way to add fruit to dessert. They're also good as an after school snack for the kids! You don't have to use just apples. Feel free to use any fruit that's in season that you might find at your local farmers market or at the grocery store. Mix sugar and cinnamon in small bowl. Lightly coat one side of each tortilla with cooking spray (or canola oil). Sprinkle with a spoonful of cinnamon sugar. Spray a small pan with cooking spray, and place over medium heat on the stove. Add one tortilla (oil side down) to the pan, with ½ apples on one side, and fold over. Cook about 1 minute or until lightly browned. Flip and cook second side. Remove from pan and cut in half. Repeat with remaining tortilla and apples, and serve with yogurt if you'd like.